I don't know what happened last week, but I became extremely interested in clearing out all the extra and disregarded clothing from my wardrobe, in order to make room for clothes that I would actually wear on a regular basis. My trip to Ann Taylor might have been the key. On Labor day weekend, my mom and I did a little shopping, and she mentioned that she wanted to stop in Ann Taylor. I have always shopped at Ann Taylor Loft so I was curious as to how they differed. I'm not sure what you think, but I was completely impressed by the quality of their clothes. The fabric is nicer, and the choices of different shirts by far exceeded the Loft. I was so impressed with what I saw that I bought one of the dresses that I found on sale. I fell in love with the style of it and how comfortable I felt wearing it. My dress is long but not too long. It's definitely a black jumper style dress with some taupe coloring AND last night, my brother-in-law's girlfriend Colleen told me that she saw my dress on Rachel Ray's Tall Fashion show a couple of days ago. 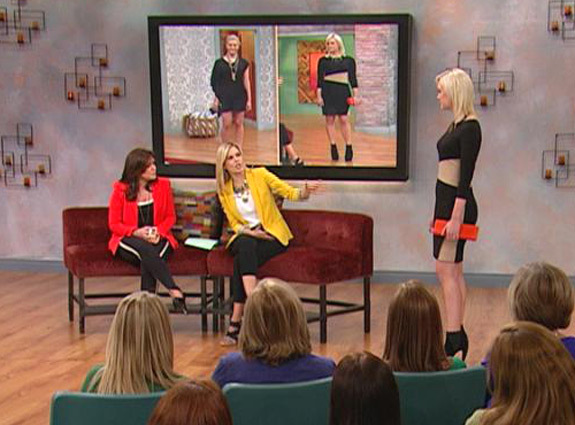 First of all, I couldn't believe the dress that I had picked out was on Rachel Rae's show, and second of all, I was shocked that it was on a show for tall fashion!! At 5'10, I'm a little proud that I picked something out that is perfect for a tall girl. The model in the audience has my dress!! The only difference is my dress doesn't have long sleeves. They were comparing the lengths of the dresses among other things. Glad I picked a good one for me. :) Ha I don't think this will ever happen to me again, but it sure was nice to see this last night! As for my closet after this trip to Ann Taylor, I have completely bagged up anything that I haven't worn in 8 months to a year. There is an abundance of room in my closet right now. Shirts are easier than ever to pick out now that I have all blouses and cardigans organized by color. If you haven't tried organizing by color you should! It also definitely gave me an idea of what I already have too much of in my wardrobe. 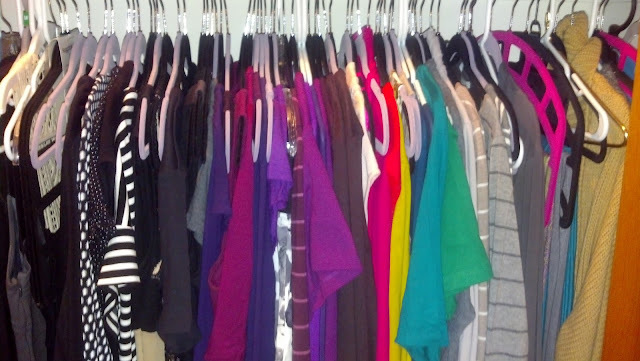 Looks like I have enough purple and black clothing to last me a life time... haha How do you have your closet organized?